Our annual sale starts this Tuesday June 7th and goes through June 11th. 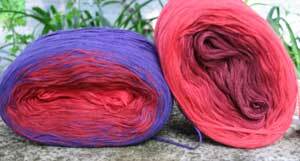 All in stock yarns are 20% off. Our frequent fiber cards do not apply during the sale. Worldwide Knit in Pubic Day will take place on the 11th from 12-4. We will have refreshments, bring a chair for sitting outside and be prepared to end the day with a smile! Great Lakes Fiber Festival and Me! The Great Lakes Fiber Festival has become part of my Memorial Weekend. My approach this year was so different because of my new spinning passion. In the past I used to go and look at the yarns and eye the animals. 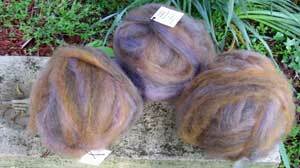 This year I still looked at the yarns but also eyed raw fleeces, checked out roving, bats and top. I looked at mohair locks and glitter trying to picture how to incorporate it into my spinning. I eyed drop spindles as I have decided they will be my new thing to collect.....I do love wooden objects....I did alot of eyeing and walked away with only two items. Two incredible finds that I will be able to have at the store by the end of June. The roving is from White Creek Wool in Michigan and the transitional cotton is from Wolle's in Virginia. The roving is subtle and beautiful with many wonderful natural tones. The cotton is incredibly vibrant with so many awesome colorways. We will let you know as soon as our shipment arrives!